The different notions referred to by the present terms must be interpreted according to Royal Decree 2.69.351 and to the specifications that regulate the vehicle rental companies in Morocco. The rental contract is closed intuit personae and is not subject to cession. "You", "the customer" : ": designates the drivers and payers mentioned on the rental contract and signatories of such contract who have capacity as Customer. "We", "the renter" :designates MARLOC sa EUROPCAR Maroc, whose corporate name appears on the Rental Contract. "The vehicle" : designates a Private Car or Commercial Vehicle that we rent to you for the duration agreed to on the Rental Contract. "Damage" : designates any damage occurring to the vehicle, including glass, lights and mirrors. "Loss" : it is assimilated to theft of the vehicle, vandalism, stolen accessories and attempted theft, as well as fire of the vehicle. "The Territory" designates the country of Morocco in which the hired vehicle is allowed to be driven. 2.1 You must supply, with documentary evidence, all the information needed by the rental company with which you have a contract, in particular: your identity, your address, date and place of birth, the category and the date of issue of your driver's licence and the method of payment of your rental. 2.2 The driver must be at least 21 years old and 23 years old for Prestige vehicles, and held a driving license for at least 2 years. 2.3 According to the tariff formula, you may have to make, at the beginning of the rental, a payment equal to the expectable amount of the rental invoice, and an authorization is simultaneously required for the amount of the security deposit. The vehicle reserved will be provided to you with the tank full of petrol, in working order and clean. Unless any possible apparent defect on the vehicle is indicated on your rental contract, before you leave the car hire station, we will be deemed to have delivered a vehicle in keeping with to the traffic rules and regulations in force in Morocco. Unfortunately, we will not be able to take into account those complaints concerning apparent damages which were not indicated at the time of departure. You must return the vehicle in the same condition as it was provided to you at the start of the rental. All the repair and refurbishment costs resulting from a wrong committed by the customer or an unknown third party will be added to the cost of the rental, subject to the conditions in the section "Summary of Optional Guarantees". You must not drive the vehicle outside Morocco and outside paved roads; the vehicle must only be driven on paved roads suitable for motor vehicles. Any damages to the vehicle caused by non-respect of this clause will be charged to the customer. In accordance with the principle of personal responsibility, you will be liable for any offences committed during the rental period. You are informed that upon the request of the Police or any official body Europcar may have to transfer your personal data. You undertake to use the vehicle in a responsible manner and in particular, not under the influence of alcohol or drugs or any other type of narcotic substance which may affect your driving, in accordance to the traffic law and to use it only for the purposes for which it is intended. For a car, this means primarily carrying passengers other than for hire and reward; for a commercial vehicle, it means primarily transporting goods. In case the conditions of use of the rented vehicle imply some specific rules, you are responsible for the respect of such rules for the entire duration of the contract. In addition, the customer is liable to indemnify the renter for any harm suffered by the latter and resulting from the infringement to these rules. We particularly draw your attention to the size of commercial vehicles, which require special attention during certain manoeuvres (i.e. reverse) and can make it impossible to get past certain infrastructures on the road (tunnels, bridges, etc. ), whose height and maximum capacity are, following regulations in force, are signalled in advance. ATTENTION : crashes against sill, under body mechanics and upper body as well as abnormal deterioration of tyres are not covered by the Damage/Loss guarantee, unless case of force majeure is proven. to commit any intentional offence. Goods and baggage transported in the vehicle, including their packing and stowage equipment, must not damage the vehicle or carry any abnormal risks to its occupants. When parking the vehicle, even if it is only for a short stop, you undertake to lock the vehicle and to use the alarm and/or antitheft systems with which the vehicle is equipped. You must not leave the vehicle unoccupied with the keys in the ignition and/or in the document wallet inside the vehicle. Failing to return the keys and the documents will lead to exclusion from theft policy. In case of damage or theft, you must inform the renter immediately about the report drawn up by the parties involved or the references to the police record establishing the official report or the receipt of the notification of theft presented by the authorities, as well as the keys and the licence and registration documents in case of theft. ADuring your rental, you will have to carry out all the ordinary. During the rental period and depending on the mileage you must carry out the usual checks (engine oil level, engine over 100 km, tyre pressure, etc. ), as would any careful user. In this sense, the customer will pay attention to the warning lights on the vehicle's dashboard and you must all necessary preventative measures, if need be, such as emergency stop. The Vehicle has been provided to you with a full set of five tyres in good condition according to road regulations. In the event that any of them is damaged for any reason other than normal wear and tear, hidden defect or in case of force majeure, you undertake to replace it immediately at your own expense with a tyre of the same dimensions, type and wear characteristics. In the event of breakdown of accident, you have the benefit, at no extra cost, of a Breakdown and Assistance Service. 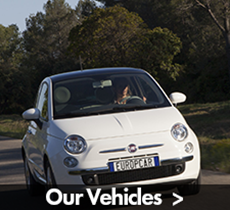 If required, this service can be contacted by the closest EUROPCAR Maroc car hire station. The terms of this assistance service are explained in the "Rental guide, Terns of Insurance and Useful Advice" brochure available from all EUROPCAR Maroc car hire stations. Any assistance resulting from shortage of lack of petrol, mistaken type of petrol or any actions resulting from the negligence of the driver are not covered by the Assistance policy and will remain at the expense of the customer. If the odometer has stopped functioning for any reason other than a technical failure, you will be required to pay a distance charge on the base of 500 kilometres per day. All transformations or mechanical interventions on the vehicle are forbidden without previous written consent of the renter. You undertake to return the vehicle to the renter at the agreed place, on the date and at the time indicated on the rental agreement at the risk of judicial civil and criminal prosecution. The rental duration is calculated on the basis of indivisible periods of 24 hours, starting from the time the vehicle is made available. However, a 59 minute grace period is applied at the end of the rental before the start of a new 24-Hour period. - you must proceed to renew the contract. The end of the rental is defined by the return of the vehicle, of its keys and of its documents to the rental counter, to a uniformed EUROPCAR Maroc agent. You shall not give the keys to any person foreign to the Europcar service or to any person present in the parking who purports to be a EUROPCAR employee. If explicitly mentioned in writing in the rental agreement the keys may be returned to the reception desk of a hotel. If the Vehicle is returned without its keys and/or documents, you will be invoiced for the cost of the replacement keys and/or documents as well as, if necessary, the cost of repatriation of the vehicle. Under no circumstances will the renter accept any liability for articles that may have been left in the vehicle at the end of the rental. ATTENTION : Only the taking of the vehicle, the documents and the keys by a EUROPCAR Maroc agent during normal opening hours constitutes the end of the rental. Reminder : You remain liable for any damages until the end of the rental contract. - In the event of attachment, confiscation or impounding of the vehicle, the rental agreement may be automatically terminated by right as soon as the renter is informed of such action by the legal authorities or by the customer. - Any use of the vehicle which may be detrimental to the renter will entitle the renter to automatically terminate by right the rental agreement with immediate effect. - In the event of loss (theft, fire) of the vehicle, the rental agreement will be terminated as soon as the renter has received a copy of the theft declaration made by the customer to the police authorities. - In the event of an accident, the rental agreement will be terminated as soon as the renter has received a copy of the accident report completed by the customer and, where applicable, the third party. The local currency used for the payment of your rental and for the deposit is Moroccan Dirham. The customers undertake to pay the cost of rental. The estimated cost of rental and additional services is to be paid in advance. It includes: price of rental of the vehicle, calculated according to the prices current at the time of rental; any possible charges or optional additional costs accepted by the customer, the different contributions to insurance policies or complementary insurances taken out; the total increased by 20%, to which the security deposit and the estimate petrol service. In the event of non-payment by the due date shown on the invoice, the customer will be indebted, after formal notice, for payment of late payment interest on the due amount at the legal rate with an extra 50% added. The customer accepts that failing to pay any invoice by the due date or any unpaid debts will render all outstanding invoices due immediately and will authorise the renter to require immediate return of any vehicles still on rent. The tariffs applicable to the rental, to the additional services and to the optional covers or insurances are those which are current on the date of issue of the rental agreement, and correspond to the characteristics you originally indicated at the time of reservation (duration, return station...). Any modification in the characteristics will entail the use of an appropriate alternative tariff to which reference is made in the brochure on the agreed tariff. The Vehicle will be provided to you with a full fuel tank. You must return the vehicle in the same condition. Otherwise, you will be charged for the number of litres of missing petrol, to which the service fee will be added. The amount of the security deposit depends, on the one hand, on the category of the vehicle hired and, on the other hand, on the additional policies taken out. It is intended to cover any harm suffered by the renter resulting from damage or theft of the vehicle. Its amount is indicated in the “Rental Guide” brochure and, at the beginning of rental, on your contract. If the customer has not taken out any contractual policy (theft and/or damages), the security deposit will be equal to the amount of the limit of the responsibilities of the customers, which will be different depending on the category of the vehicle provided and indicated on the 'Rental Guide' brochure. If the customer has taken out a damage/theft contractual policy (Note: LDW or SLDW put back or ticked on the contract), only a deposit equal to the amount of the non-redeemable excess charge will be required from the customer in the event of damage or theft. In the absence of damage or loss, the amount of the security deposit effectively paid will be reimbursed at the end of rental, subject to the delay of cashing the paid amount. 7.1 You are responsible for the vehicle that has been entrusted to you. In the event of an accident, with or without a third party, you will have to fill in an automobile accident report and hand it over at your EUROPCAR Maroc hire car station within 48 hours. In the event of theft of the vehicle or damages caused to it, or in the absence of responsibility of a third party, you must fully indemnify the renter with an indemnification equal to the harm actually suffered (amount estimated by an expert of the expectable cost of repairs or monetary value of the vehicle and, if necessary, immobilisation fees, administrative fees,...). From the end of rental, in the event of damage or theft, an amount equivalent to the non-redeemable excess charge will be invoiced to you (see tariff brochures). Should the harm suffered by the renter be reduced (discovery of the vehicle within 30 days, partial or total liability on the part of a third party…), the customer/s will be reimbursed an amount equal to this reduction. This liability is limited if you have taken out the “reduced liability” policy in the event of damage and/or theft expounded in the paragraph below. The renter has no liability whatsoever towards the customer or any third parties in case of accidents or damages produced during the rental period. Also, the renter is not responsible for those damages caused by defects on the vehicle resulting from manufacturing, technical control or administrative faults in the due dates communicated by the renter. ALL THE FOLLOWING GUARANTEES ARE ONLY APPLICABLE ON THE TERRITORY (see Article 1-Definitions and General Notions), FOR THE DURATION OF THE RENTAL AGREEMENT AND SUBJECT TO COMPLIANCE WITH THE REQUIREMENTS OF THE TERMS OF ARTICLES 2, 3-2, 3-3, 4 OF THE PRESENT TERMS AND CONDITIONS. In order to reduce your liability on the amount of the non-redeemable excess charge, you have the option of taking out the contractual guarantee in the event of damage/loss (LDW, SLDW mentioned or ticked on the contract), via payment of a flat faire per rental day. Some of our tariffs include this guarantee. Even if you opted for this possibility, you will be invoiced, for each accident, the amount of the LDW non-redeemable excess charge or SLDW fixed excess charge, variable depending on the category of the vehicle, and indicated on the 'Rental Guide' made available to you at all EUROPCAR Maroc car hire stations and on the contract, at the beginning of your rental. If the amount of the harm suffered by the renter is below this amount, only the actual amount of the harm will be due. If your responsibility is completely cleared, and as soon as reimbursement is received from the third party, this amount will be returned to you in full. ATTENTION : You are responsible for the vehicle that has been entrusted to you. The drivers non-designated on the Rental Contract, and for whom the customer remains responsible, will not claim any benefits resulting from the Damage/Loss guarantee of the vehicle. Failure to respect any of the obligations explicitly stipulated in articles '1', '2', '3.2', '4' and '5' of the present General Terms, the hit-and-run offence and in general failure of the customer/driver towards his/her obligations, will result in forfeiture of the contractual guarantees taken out. The customer/s will then be responsible for the totality of the accident in the conditions of the common liability law. All our vehicles are covered by a 'Third Party Legal Responsibility' policy, following laws and regulations in force in Morocco. They also benefit from a contract of technical assistance with the EUROPCAR Maroc hire car stations and the contractual partners who will be indicated to the Customer when he/she asks for assistance from the closest EUROPCAR Maroc hire car station. The Customer can also take out an optional “Driver and Passengers” insurance (mentioned as PAI or ticked on the contract) by paying a fixed fee per day of rental. The conditions and limitations of compulsory or optional insurances, of the contractual guarantees, as well as those of the assistance contract will be expounded on the 'Rental Guide, Conditions of Insurance and Useful Advice' brochure available to you from all EUROPCAR Maroc car hire stations. Any supplement or modification of the rental contract will have to take the written form. Any litigation between the parties originating from the present contract and not resulting in an informal agreement will be within the competence of the Casablanca Commercial Court.